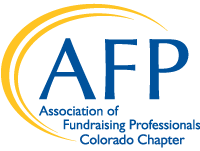 Presented to an individual who has demonstrated significant and lasting philanthropic accomplishments in Colorado for at least 10-20 years. The accomplishments must cross multiple issue areas, such as arts and human services. The individual must embody the characteristics inherent in two or more of the award categories below. This is the highest honor presented at National Philanthropy Day. Past Winners: Marilyn Van Derbur Atler, Steve Graham, David E. Henninger, Doris Kester, Charles D. Latuda, Ann Love, Sally Rippey, and Sue Anschutz- Rodgers. Presented to a large for-profit business that has demonstrated outstanding long-term or sustained commitment through financial support and the creation of a corporate philanthropic culture that encourages and motivates employees/others to take leadership roles in philanthropy and community involvement. Past Winners: Adelphia (formerly Century Communications), Agilent Technologies, Alpine Banks of Colorado, Anadarko Petroleum Corporation, Ball Corporation, Breckenridge Grand Vacations, Central Banks of Denver, City Market Stores, Inc. (Grand Junction), CoBiz Financial, Colorado Springs Utilities, Comcast, Continental Airlines, Denver Newspaper Agency/Post-News Community, Dependable Cleaners, Exempla Lutheran Medical Center, FirstBank Holding Company, Hogan & Hartson LLP, Holme Roberts & Owen (Denver and Colorado Springs), Johns Manville Corporation, Kaiser Permanente, Kroenke Sports Enterprises, Noble Energy, Norwest Banks, PACE Membership Warehouse, Public Service Company of Colorado, SM Energy, The Pueblo Chieftain, Qwest Communications, Wild Oats Community Markets and Xcel Energy. Presented to a for-profit small business that has demonstrated outstanding long-term or sustained commitment through financial support and the creation of a corporate philanthropic culture that encourages and motivates employees/others to take leadership roles in philanthropy and community involvement. Past Winners: Bachus & Schanker, LLC, Bluepoint Bakery, Delta Dental, Denver Curves Co-op, FredrickZinkElliott,P.C., InsureMe, Johnston Wells Public Relations, KB Home – Mountains Division, Kundinger, McCutcheon, Corder & Engle P.C., Left Hand Brewing Company, Montgomery & Steward Funeral Directors, Inc. Multi-Link, Odell Brewing Company, OtterBox, The Rangely Office of Chevron/Texaco Production, Rocky Mountain Coffee Connection, Security Central, Snooze: an A.M. Eatery, and Vesta Dipping Grill. Presented to a grantmaking (private or community) foundation (giving to the broader community, across several funding areas, not just one organization) that has demonstrated outstanding commitment through strategic financial support and through encouragement and motivation of others to take leadership roles in philanthropy and community involvement. For corporate foundations, please focus on the work of the foundation, not the company's entire philanthropy program and employees. Past Winners: Anschutz Family Foundation, The Anschutz Foundation, Bohemian Foundation, Boettcher Foundation, Bonfils-Stanton Foundation, The Colorado Health Foundation, The Colorado Trust, Community First Foundation, Community Foundation of Northern Colorado, Adolph Coors Foundation, Daniels Fund, Delta Dental of Colorado Foundation, The Denver Foundation, El Pomar Foundation, Brownson Memorial Fund, Energy Outreach Colorado, First Data, Western Union Foundation, Gates Family Foundation, Gay & Lesbian Fund for Colorado, The Hunt Alternatives Fund, A.V. Hunter Trust, Inc., Helen K. & Arthur E. Johnson Foundation, Latino Community Foundation of Colorado, Piton Foundation, Pueblo Hispanic Education Foundation, Rose Community Foundation, Temple Hoyne Buell Foundation, US West Foundation,Women's Foundation of Colorado, and Xcel Energy Foundation. Presented to an individual who has a record of exceptional personal generosity that demonstrates outstanding civic or charitable responsibility and whose leadership has encouraged others in philanthropic roles. Past Winners: G. Wayne Ballah, Morley C. Ballantine, Laura Barton, Marcy and Bruce Benson, LaFawn Biddle, Joan Brennan, Merle Catherine Chambers, William K. Coors, Tammy and Noel Cunningham, Bill Daniels, Margaret Foote, Sam Gary, Tim Gill, Barbara Grogan, Gail and Dave Liniger, Kathy Loo, Harold MacArthur, Sharon and Bob Magness, Frank Massard, Anabel C. & Jerome P. McHugh, Myra and Kenneth Monfort, Janet Mordecai, Conrad Nelson, Alan R. Phipps, Jared Polis, Daniel L. Ritchie, Edward and Richard Robinson, Linda Shoemaker, Bea Taplin, Judi & Joe Wagner, Florence Winograd and J. Robert Young. Presented to an individual grantmaking professional who works at a grantmaking organization (or one who has made a significant impact as a professional and is now retired or working as a consultant) and who has made a significant impact through outstanding commitment, dedication, and talent toward promoting and supporting philanthropy over a sustained period of time in the community. This individual has demonstrated commitment to advancing philanthropy through mentoring others in the profession and holding various volunteer leadership positions in the community. Past Winners: John H. "Jack" Alexander, Joni E. Baird, Sheila Bugdanowitz, Linda Childears, Ted Harms, Elsa I. Holguín, Stan Kamprath, Peter A. Konrad, Terri Konrad, John R. Moran, Jr., Jeff Pryor, Tim Schultz, Christine Soto, Susan Steele, and Robert F. Sweeney. Presented to an individual fundraising professional who works for a 501(c)(3) public charity (or one who has made a significant impact as a professional and is now retired or working as a consultant) and who has made a significant impact through successful fundraising, outstanding commitment, dedication, and talent toward promoting and supporting philanthropy over a sustained period of time in the community. This individual has demonstrated commitment to advancing philanthropy through mentoring others in the profession and holding volunteer leadership positions in the community. Past Winners: Mitzi R. Barnes, Karen Campbell, Elycia Cook, Bob Cooper, Jennifer Darling, Bonnie Downing, Debra Edwards, Griff Freyschlag, Donna Hultin, Dianna L. Kunz, Jackie Norris, Jan Weimer, Carolyn Schaefer Wollard, Russell Schuckman, and Alexandra Yajko. Presented to a volunteer social club/community service group (with no paid staff) that has demonstrated outstanding commitment through financial support and the encouragement and motivation of others to take leadership roles in philanthropy and community involvement. This category does not include nonprofit 501(c)(3) public charity organizations providing direct services. Past Winners: Altrusa International of Grand Junction, Assistance League of Colorado Springs, Assistance League of Denver, Capitol Hill United Neighborhoods, Inc., Catholic Charities of the Archdiocese of Denver, Colorado Association of Realtors Housing Opportunity Foundation, Community Shares of Colorado, Denver Active 20-30, Denver Mile High Rotary, HomeAid Colorado, Fruita Thrift Shop, Grand Junction Lions Club, Hugo Improvement Partnership, Impact100 Metro Denver, Italians of America, North Denver, Junior League of Denver, Kiwanis Clubs of Alameda West, Arvada, Arvada Jefferson, Columbine, Lakeside and Lakewood, Loaves & Fishes, Mile High United Way, Optimist Club of Monaco South, The Rotary Club of Denver, The Rotary Club of Southeast Denver, Scottish Rite Foundation of Colorado, Steamboat Rotary Club, Xi Pi Chapter-Omega Psi Phi Fraternity, Inc., Woman's Club of Ouray, Zonta Club of Denver and Zonta Club of Denver II. Presented to an individual who has demonstrated excellence in volunteer service leading to significant outcome for the community. This individual must have demonstrated exceptional leadership skills in recruiting, motivating, and coordinating groups of volunteers, devoted great time and effort to the advancement of volunteerism, or shown deep commitment of voluntary action to address community needs. Past Winners: Pres Askew, Steve Austin, Bob Bell, Ray Cushman, Valerie Escatel, Steve Fobes, Sue Foerster, Jackson F. Fuller, Jim Garcia, Ed George, Arden (Denny) Gray, Jamie Hamilton, Robert F. Hill, Gaku Homma, Eric Hughes, Susan Lane, Virginia Lappala, Nadyne Leedom, Millie Malcolm, John McConnell, Jerry Middel, Julie Gomez-Nuanes, Andrea Philleo, Wynafred Plunk, Kenneth M. Portuese and Larry Wolk, M.D. Presented to an individual who has demonstrated exceptional leadership skills in coordinating, recruiting, and motivating others to make financial contributions, demonstrated his/her own financial support, and shown a commitment to the advancement of philanthropy. Past Winners: Jamie Angelich, Shirley Bradsby, Dorothy Brandt, Bob Charles, Robert L. Cohen, Patty Cook and Sarah Schnabel, Charlie Forster, Caleb F. Gates, Jr., Malcom Giles, E. Atwill Gilman, Arlene Hirschfeld, Walt and Georgia Imhoff, Kelvin B. Kent, Jackie Kingsbury, Max Martinez, Pat Miller, Greg Poschman, Dean Prina, M.D., Kristin Richardson, Nelson A. "Buz" Rieger, Madeleine St. John, Arthur & Julie (posthumously) Seiden, Mary Sissel, Katie Stapleton, Robert Tointon, William Vega, Cora Wall, James B. Wallace and William H. Winn. Presented to an individual youth volunteer (18 and under) who has demonstrated outstanding commitment to the promotion of philanthropy and volunteerism through his/her work in the community. This commitment is demonstrated specifically through activities over a period of time. The individual acts as a role model for other youth in the community and generates interest in volunteerism in other groups. The winner will receive a $3,000 award for education expenses. Past Winners: Marko Babiak, Christina Bear, Tim Brungardt, Jenna County, Gage Crispe, Amaya Garcia-White Buffalo, Danielle Graham, Sarah Greichen, Briana Johnson, Janean Jubic, Emily Masar, Alyssa Motz, Nicholas Owens, Samantha Pelican, Michelle Romero, Joey Ruffini, Nichole Saucedo, Isaac Solano, Laura Ann Sprowls, and Allison Winn. Presented to a youth group (18 and under and not a program of a nonprofit organization providing direct services) that has demonstrated an outstanding commitment to the promotion of philanthropy and volunteerism through their work in the community. This commitment is demonstrated specifically through activities over a period of time. The group acts as a role model for others in the community and generates interest in volunteerism in other groups or individuals. The group will receive a $3,000 award to assist in the continuation of its community work. Past Winners: Arapahoe High School Student Council, Aspen Middle School (Peter Westcott's 5th & 6th Grade Classes), B.I.O.N.I.C. Team, Bradford Elementary School - Community Outreach, The Brighton Youth Commission, City of Boulder Youth Opportunities Advisory Board, Collbran Job Corps Center Students, Glenwood Springs High School A-Team, Lafayette Youth Advisory Committee, Lewis-Palmer High School Serteen Club, Logan School for Creative Learning, Lowry Elementary Eagle Ambassadors, Mountain Vista High School Student Leadership, North High School Ethics Club, Parker Kids' Club, Rock Canyon High School Student Council, Safe City Youth Power Leadership Team, Student Community Involvement Team, Vilas Citizenship and Leadership Council, and Washington Elementary Project L.E.A.D. Service Learning. *These guidelines are current for 2019. Previous winners may have been selected and won under different guidelines. Previous award winners are only eligible for nomination five award cycles after their award year.